Feeling a little nature deprived? No trees nearby to hug or sit under and enjoy the cool shade of their canopy? Maybe calling a tree would help you feel better! 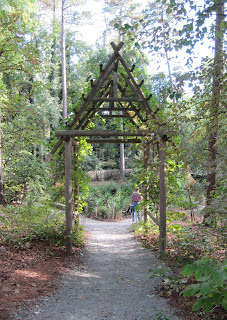 I spent a lovely late afternoon, early evening at the Sarah P. Duke Gardens in Durham, North Carolina today surrounded by trees, shrubs, perennials, annuals, and all kinds of bees & butterflies, but still felt the need to call a tree because for the first time in my life, I had the number of a tree to call. It was a flowering dogwood, Cornus florida, which turns out to be the state tree of North Carolina. By calling the tree, I heard about how the tree blooms in the spring before it leafs out and that the white “petals” are really bracts. Then in the fall the birds enjoy the red berries of this native tree. The tree also clearly pronounced its name for me. 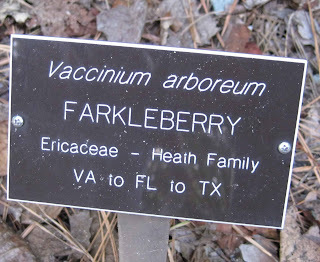 If I had its phone number, I would also call the Farkleberry, too, because I love that common name. What a great way to learn about trees while spending time in a beautiful garden! I can see it now: 1-900-TREE-LUV. Lonely birches! Wild willows! Naughty pines! They're practically bursting with pollen, and they're waiting for your call! . . . It is a whole new world when you can call a tree...but I love it. I hope you are having a wonderful time! Phone call to a tree!!!! that sounds so lovely. You must had great time there. I m excited though at this thought of Tree calling its name. I have had some personal conversations with a tree before but never over the telephone. The garden is becoming so sophisticated any more. You are having too much fun here. I am glad you are using that new camera some. Oh my goodness, I love that. Was the tree a male or female? Did it have the North Carolina accent? Is it going to call you back, go for a coffee maybe? It does make me wonder what kind of phone plan they have! We saw a similar system at the Chattanooga Aquarium for the fish. The 21st century version of the Talking Trees (with push button recorded info) in Morganton, NC. What a kick! Mr. Subjunctive's comment made me smile, I was thinking the same thing. Call a tree is a great idea. I'd love to hear them tell me all about themselves. I am a tree lover. Oh, great. 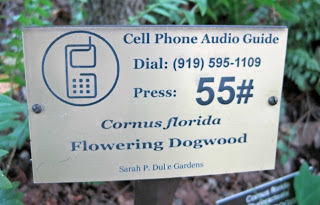 Now my dogwoods are demanding their own cell phones. The farkleberry is happy to just hang out on the corner with a deciduous magnolia with great charms. BTW, this has been a great dogwood year for new growth. Looks as if you had a great trip to NC.